"Deliver us O Lord from the fury of the Northmen!" Norse longboats have been sighted on the ocean waves! Take control of an isolated fishing village somewhere off the coast of Ireland, with limited technology, few resources and no immediate soldiers to call upon. You will have to make do with what is available to you. Battle-hardened Norse warriors are also on the prowl for your holy Christian relics and you will need to keep them safe if you are to secure victory. Can you withstand the Norse raids? I hope you enjoy this scenario! This file requires only the base game in the Conquerors to function but it works fine with Userpatch 1.4. - Fixed the accumulate relics bug whereby the computer mistakes the player for owning more relics than what he might actually have at the time. This relates specifically to an objective later in the game. - Abbot Greig now makes mention of taking your villagers either to the Armoury or Practice Range to equip them for battle. - Amended a number of timer conditions for important events that occur throughout the game. Hi Mashek, I had the steam version with every dlc including the rise of raja, i download the file and put every file in their correct folder but when i go to custom campaigns it won't appear. there is something i'm doing wrong? Really cool ideas and fantastic looking map. I wasn't able to finish it because I had some sort of bug where Boniface never landed (I used marco/polo after waiting for him for about 15 minutes after I got the message saying a fleet was sighted off the shore) but I will try to load from an earlier save and hopefully avoid this bug. Pretty lucky for him in fact; we used that long delay to fully train a 30 person army and we were ready for him! I did have a few ideas and comments though. -I thought the Monastery capturing/sacking on our Island was a really cool idea but it could have been explained better. At one point I received a warning that if any more relics were captured we would lose, but later on they captured the monastery again (and we recaptured it shortly after). It suggested in the hints that we might want to keep the relics in the village to keep them safe but I never felt like I needed to do that because we recaptured the monastery both times we lost it without any penalty. Also, we went and destroyed one of their monasteries and stole a relic from them and never received any acknowledgement for that. Perhaps my playthrough was a bit bugged and we should have lost? -Perhaps the blacksmith could have been explained; I did not see it mentioned in the hints and I did not even try using it until quite a bit later into the game because I assumed the technologies would not do anything. The fact they did shows really impressive design; but maybe you should make it more clear to players? -I really liked the idea of activating and deactivating my villagers to act as warriors but the balance of this scenario seemed to make that quite foolish. I was playing on moderate. It cost 100 food and 100 food, 50 wood to train the militia and skirmishers respectively. This was a huge amount; it did not really make sense to every deactivate your troops because another raid would arrive a minute later and if you de-activated someone, you would need to spend another 100 food to reactivate them. Additionally, your 'militia'(the skirmishers and militia) were so weak compared to the rest of your army (the berserkers, throwing-axemen and men at arms you would steal from the raiders) that it did not make sense to ever use them. Most raids would be best handled by using the monks to attempt to convert the enemy elite units and let your standing army of stolen troops fight the rest. I think the conversion aspect was really cool, especially considering the historical aspects with Vikings and Christianity, and I loved the bit later on in the game where they research heresy, but the 'activation/deactivation' mechanic was really rendered moot by the conversion. It did not make sense to spend 150 food on a weak militia when you could just as easily steal much better troops. I wonder if you could either lower the prices of activation, increase the quality of the militia troops (perhaps instead of militia you could recruit the 'infiltrator' unit?) and perhaps have the Vikings recruit heresy much earlier on? Otherwise I think this excellent mechanic will just not be used. I know I made a lot of negative remarks in this comment but I was just trying to point out the issues I found; overall I think this is a fantastic game with one of the most beautiful maps I have seen in a while and some really excellent gameplay ideas. I hope to write a review at some point soon. Thank you for making such an excellent game. I just wanted to add I've tried the game a few more times from the beginning. I am still having trouble setting up for the final climatic battle. If I don't pay Boniface ever, or if I pay him once and not the second time, I keep receive the message he will attack, his longboats pour in and attack everything near the water, but his transport ships (Jarl's longboats) never seem to move. I am unsure what I am doing that causes this bug. If I do pay him twice, he still does move to attack, at which point killing him does not seem sufficient to stop the attack. I find the pacing of this a bit strange as I receive a message suggesting I go steal the relic (which is pretty simple) but also optional missions to attack the enemy docks...but that is very difficult with the short period of time as there is only a minute or so after receiving this mission before he lands. Is this intentional? If you pay him twice, is the relic victory the only way to win? Once again though, really cool AI. When Boniface does land his multi-pronged attack was really impressive; my village was surrounded on every side. Just a quick note but I have received numerous reports that the game does not work as it should on HD. If at all possible please play this scenario on the CD or with Userpatch for which it was designed. @Sirkurt, I am largely unfamiliar with HD as I do not actively design for it. I guess the files should be placed in the following: Age2HD\resources\_common\campaign. @Thomas_Elliott, no need to apologise. There's a big difference between being negative and posting constructive criticism, and your observations are nothing short of excellent. My thanks to you! I should have requested your playtesting skills before uploading the file, as to my great shame there appears to be a whole number of issues I need to get to work on immediately. That being said, if you do plan on reviewing this file I would appreciate it if you hold off for another week, by which time I should have ironed out the majority of the issues you listed in a fresh update. 1. Bornifast's invasion has been quite troublesome to trigger. The AI is meant to send the transport ships when I trigger 10 food to player 5 (the gold tributes made earlier should not affect this). On my last playthrough the AI worked and the transport ships were sent straight to my island. I could always just trigger the landing zones for the transport ships but I wanted a certain degree of spontaneity with the enemy's attacks. A: If you succeed in sending both gold tributes to Bornifast/Player 5, the enemy should cease the majority of their attacks, giving you a moment of peace to strike at the third relic. 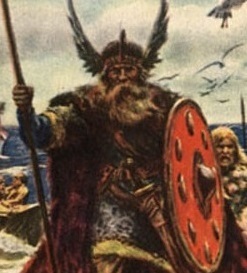 Bornifast and his men will unload from their ships at the main Norse encampment, but he will betray you in several minutes and renew his attacks. B: If you fail any of the tributes, 10 food is triggered to player 5 which signals the enemy to attack. It appears this seldom works. I might even just create a fail safe whereby a simple trigger sends the ships to the beach if Bornifast hasn't already left to attack. 2. There's a game coded bug that doesn't seem to recognise the accumulate relics condition, but sometimes fires after a save/load. I will tinker with the relic loss condition and make it so you no longer lose the game, but the dialogue will remain as a note to be wary of the enemy's attacks. Also, each Norse capture of your monastery deducts 200 gold from your stockpile. I will need to make mention of that somewhere too. 3. I'll write something up in hints for the Blacksmith. 4. I agree with you on the prices of the troops and I will lower them accordingly. My thoughts at the time were to try and challenge the player who would very quickly and ably accumulate lots of food at the start of the game. As for the weak militia unit, I'm afraid that's the point of the game. The Norse were experienced and battle-hardened warriors, the Irish in this scenario however are defenceless fishermen who must quickly prepare themselves for war from virtually nothing. Perhaps for the sake of playability I will make it so that the player receives men-at-arms when he researches both forging and scale mail armour at the blacksmith. In the same way the player also receives elite skirmishers for researching fletching and padded archer armour. 5. I will tweak the conversion mechanic to ensure it's properly balanced over the three difficulty levels. Obviously on standard the player should be able to convert a few units before the mechanics kick in, while on moderate and hard the range for converting units lowers dramatically, meaning the player should only be able to convert a few choice units before the enemy receives heresy. As for the remarks from your second comment, it would appear there are some bugs involved. I will rectify these issues as soon as possible and have a fresh update hopefully resolving all your issues. Until then, many thanks for the observations and your compliments! I am looking forward to the update and intend to write a review after that. I think maybe I did not correctly explain my issue with the relics. I do not think you should remove the relic capture aspect from the game as a loss condition. My remark was almost the opposite; I seemed unable to lose from the relics. I think that it is a really good aspect to the game that you lose the game if the enemy control all of the relics; I think this would encourage you to be either more strategic in protecting the monastery, or force you to pull at least one relic back into the town. I think my issue might have arisen because the enemy captured my monastery but then did not put the captured relics back into it? Perhaps all of their seers were dead at this point? If they had done so, would they have won the game? If I have a bit more time I might try to test this a bit more myself. I think I was confused because every time I loaded from a save I received the message about captured relics, and I was not aware I would lose the game if the enemy captured them all. I think this is a really great concept though to capture the idea of the Vikings raiding for loot and the vulnerability of remote monasteries. I have unfortunately been much busier than expected and haven't been able to give this scenario the work it deserves, however here is a quick update to tidy up a number of issues. - Unit training costs at the armoury and practice range significantly reduced. - Player can now train men-at-arms. - Training men-at-arms now requires stone (iron), which forces the player to search for and use the stone mines. - New hints now mention how researching certain blacksmith technology will enable men-at-arms and elite skirmishers. - Difficulty dynamics implemented for converting enemy units. - Fail safe implemented if Bornifast fails to attack. - Various map design tweaks. "Wind of the North" depicts the story of an Irish fishing village which finds itself placed squarely in the path of viking invaders seeking plunder. "Wind of the North" is the single most enjoyable scenario I've played in the months since coming back to AoC. The situation is that your peaceful island monastery falls squarely in the path of the onrushing viking invasion, which sees you desperately staving off fierce warriors with little more than the equipment of shepherds and the prayers of your priests. The challenging raids, superb map, and immersive environment contribute to create an immensely playable game. The weight of forces between the well armed, savage vikings and the men of your peacefully village was well calculated;the player barely has enough to stave them off while never encountering a common problem of many B&D of power accumulation. Quite often when the player accumulates a large amount of either units or resources, the challenge falls off as the enemy AI cannot pose a threat to the player anymore. That wasn't the case in North Wind, as the the players force was limited by the need to balance economy with military expenses in men and resources in light of the low population, which makes sense for a monastery located near this remote island village and feels less arbitrary for it. Of course, the enemies being vikings would suggest an immediate naval supremacy, which is certainly the case here;the player can only defeat the enemies navy in small parts and cannot really prevent the AI transports from reaching their landing points. The player certainly never gets the feeling that defeat is some far off prospect, and the game presents a continuously intense challenge. Naval invasions have long been a weakness of the AI, giving authors of viking raids style scenarios a struggle to overcome to provide a good game. This time around a combination of scripting and trigger work did well to create a set of fierce viking raids upon the player, and doing so with actual game mechanics, not just spawning troops on a beach or the like. Not only this, but an excellent composition of music and sounds did well to create an immersive environment lending a real sense of dread to the looming viking threat. It was quite nice to see that even after the 1 hour mark the AI could keep up raids on the players base, as most AI opponents in B&D style games breakdown after a certain point. This is a combination of a carefully crafted base for the AI and a smart script, for which it seem HockeySam could receive part of the credit for. That takes nothing away from this scenarios excellent creativity, however, as many scenarios take input from others in various forms to become better. Finally, the ability to cripple the enemies force production by killing docks and military production facilities was a welcome sight. Although their economy, as it were, cannot be touched it's sufficient that their forces can be neutralized, which alleviates any concerns over the enemy receiving infinite spawns. Featuring a combination of good gameplay elements, musical and sound effects, an excellent story with a compelling villain, great map design details that fit perfectly into the setting, with no asset being used and featured in the scenario that felt extraneous or out of place, the scenario brought together a good deal of elements that worked together to create a greater work. Therefore im going in for the full 5 in this category;great stuff! Players are greeted with a lovely view overlooking the ocean from some bluffs, where we glimpse a viking longship before hurrying back to the village. One of the first thoughts that struck me was relief at seeing the entire island lit up so that it was visible from the start;none of the usual stumbling around in the fog while a fast paced game was unfolding. The mapping at large was superb, with fine detailing at all points, with some excellent highlight materiel, such as the hermit's lighthouse, the monastery both on your island and the one held by the vikings, the opening scene itself, and even the village is quite nice, especially when you take into account the inherent conflict of combining both B&D gameplay and aesthetics into the same base. One thing that stands out is the use of rocks and vegetation on cliffs;these at no time look like they are floating haphazardly, but instead are immaculately crafted to flow down the cliff giving a real impression of actual elevation. The ocean itself is quite nice featuring very nice water mixing with carefully placed gaia objects creating a good illusion of increasing depth away from the shoreline. The story of North Wind is a compelling one of the underdog peasants versus a ruthless band of warriors who care only about their plunder, mead, and other such viking pursuits. A well written and substantial story introduces us to the game, although this is best read with the ingame objectives menu and not squinting at the much smaller pregame intro screen. The hints were well written and comprehensive, leaving the player with no doubts or confusion as to how to play if needed, while the scouts report issued much of the same in a less spoiler-filled way so the player can forego the hints page and still play the game just fine if desired. As mentioned in the Creativity section, a carefully selected music and audio composition served to greatly increase the immersion, which combined with the fluid gameplay and challenging raids created it's own story of fighting off the Northmen. Bornifast was a good villain despite having no special boss battles or mechanics of the sort, instead the player loathes this character for attempting (or managing!) to bully you into giving tributes of gold, after which he of course betrays you anyway. Giving this man a well-earned dirt nap was an enjoyable process even if he was killed as a normal AoC unit in ordinary combat. Just a minor point, but it would been interesting to see what became of Cal, who seemed to disappear after the opening. There was an optional objective at the start to equip him at the armory, but there is nothing that differentiates him from another villager when sent to do this. Another little note that could have been improved on was showing the fate of the other monastery that was looted;there was room for cinematic, and even a message at one point about it, but we didn't seem to have been shown anything about it directly. Final Thoughts: "Wind of the North" is a must play scenario, and makes an easy recommendation to download. hi,noob here. want to play scenarios but dunno how to install them. can someone tell me or give me a guide link pls? thank you.